Bubbling with blue cheese, these veg-packed toasties make a quick and comforting midweek supper. 1. Heat 15g butter in a large frying pan set over a high heat. Once foaming, add 1⁄2 the mushrooms and fry, stirring, for 2-3 minutes, until starting to soften; season. Add the lemon zest and 1⁄2 the juice; cook for 1-2 minutes, until the liquid has evaporated. Transfer to a plate and repeat with the remaining butter, mushrooms and lemon juice; set aside. 2. Add the cavolo nero to the pan with 4 tbsp water; season. Cover and steam over a medium heat for 2-3 minutes. Uncover and cook for another 2-3 minutes, until the water has evaporated; set aside with the mushrooms. 3. 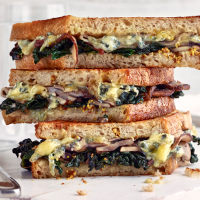 Make 2 sandwiches, dividing the mustard (add more to taste, if liked), cavolo nero, mushrooms and cheese between the toast. Press firmly to encase the filling, then spread the tops with a little more butter. 4. Place the pan over a medium-high heat and fry the sandwiches, butter-side down, for 1-2 minutes, pressing with a spatula, until golden. Spread more butter on the top side, then flip and fry for a final 1-2 minutes, until golden. Cut in half and serve, with a crunchy pickle, if liked.